Squeezed at the start of Sunday’s $100,000 Riley Allison Derby, Nitrous got off to anything but a favorable beginning in his two-turn debut. 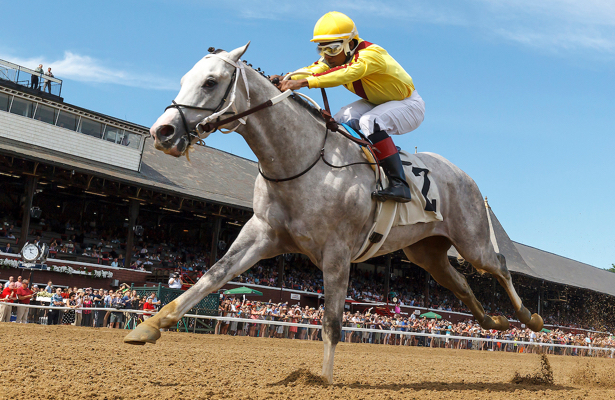 But whereas in previous races he’d have been done for going anywhere from five to seven furlongs, the gray son of Tapit took advantage of the distance, looking like one for the 2019 Kentucky Derby Radar again. Nitrous rallied to win the first local prep toward the Sunland Derby (G3) after spotting the field 10-plus lengths at the start. Under jockey Luis Contreras, he went on to complete the mile in 1:36.98. The Winchell Thoroughbreds and Stonestreet Stables runner looked to be tiring a bit late, but that’s understandable. He didn’t pass a horse in the field of 10 until entering the far turn, when he began to pick them off quickly. A stretch duel ensued with Sheriff Brown, half-brother of the 2018 Sunland Derby winner Runaway Ghost. Sheriff Brown looked like he may re-rally up the rail, but Nitrous held on to collect his first victory since his second start July 21 at Saratoga. Following the maiden victory, Nitrous gained Grade 1 placing in the Hopeful Stakes, ran ninth in a turf sprint, Keeneland’s Indian summer Stakes, and finished fourth in a Churchill Downs allowance on Nov. 10 that included future stakes winners Classy John and Six shooter. Nitrous’ Equibase speed figure from the Riley Allison Derby came in a point lower than for his Churchill race, understandable given both the class of his competition at Sunland Park and the slow break. Based at Fair Grounds, the homebred could prove formidable should he return to New Mexico for the March 24 Sunland Derby. In addition to the $800,000 purse, the Sunland Derby offers Kentucky Derby qualifying points on a 50-20-10-5 scale. Preceding it is one other local prep race, the $100,000 Mine That Bird Derby on Feb. 24 at 1 1/16 miles. Winchell thoroughbreds won the Mine That Bird Derby a year ago with Reride, who went on to run third in the UAE Derby (G2).